Thousands of protesters have taken to the streets in Istanbul to demonstrate against the rising cost of living and crippling inflation in Turkey. Surrounded by a heavy police presence, the protesters held banners with references to the "yellow vest" movement in France, which began as a demonstration against fuel price hikes but snowballed into anti-government protests. 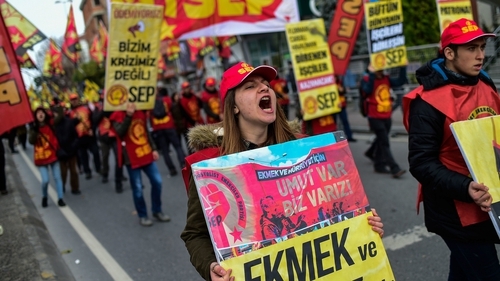 The protest, organised by the KESK, a confederation of public service workers unions, drew people from all over Turkey including the northwestern provinces of Edirne, Bursa and Yalova. The protest comes almost a week after thousands of people demonstrated in another KESK rally against the cost of living in the southeastern city of Diyarbakir. The Turkish economy has come under heavy strain since a currency crisis in August and inflation reached 25.24% in October, a 15-year-high. Although inflation dropped to 21.62% in November, the price of everyday goods remains high. Since the start of this year, the lira has lost nearly 22.5% in value against the US dollar. The country's economic growth has also slowed down raising fears of a recession after the economy contracted by 1.1% in the third quarter compared with the previous quarter.